With the popularity of 5- and 6-string basses going beyond fad status and becoming mainstream, we added a switch to adjust the bass frequency to extend into those lower registers. We also added a mid-range control and a switch to adjust its frequency. The core of the SansAmp Bass Driver and all of its tones remain true to its original design. PRESENCE â controls the amount of definition and upper harmonic content. DRIVE â adjusts the overall gain structure and overdrive. LEVEL â regulates the XLR and effected 1/4″ output levels. 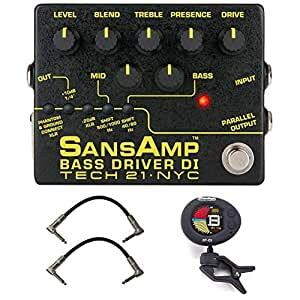 BLEND â allows you to mix the direct bass signal with SansAmp Tube Amplifier Emulation circuitry (which is particularly useful for basses equipped with piezo pickups). BASS & TREBLE â are active EQ controls, specifically tuned for bass guitar, that cut or boost +/- 12dB.